Up! Your! Deck! Special – Vorthos can win too! This entry is part 6 of 7 in the series Up! Your! Deck! It’s Vorthos week on commmandercast.com, where we take time out to talk about the guys who really just want to play their sea monster Wrexial, the Risen Deep deck and be left alone. Vorthos are players who play for the flavour of Magic, who don’t really care if their deck is winning as long as it all makes thematic sense. Basically, they are the sort of player who would never read one of my articles. But I love Vorthos all the same. Vorthos players make some of the most fun and hilarious decks around, and the fact that they aren’t particularly competitive means they usually have some of the best sportsmanship at the table (please note my use of the word ‘usually’ in the last sentence). Vorthos serves as great reminder to everybody that this is just a game, and we should all just relax and have fun. But this article series isn’t about relaxing, it’s about building a stronger deck. So here is my gift to Vorthos: a list of my favourite mono-colour generals that can wipe the board out while staying totally in character. Unfortunately, none of these generals are known to LARP. 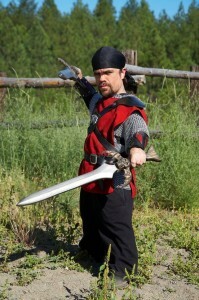 So here is a picture of Peter Dinklage doing it instead! Kemba is a super strong deck – no surprises there for anyone. Her abilities enable a powerful Voltron attack or a total token swarm, all at the exact same time! But what most people don’t stop to realize is how insanely thematic and flavourful a normal Kemba deck is without even trying. “Here, kitty kitty kitty. Nice, kitty kitty kitty. Why are you carrying that sword, kitty? OH GOD PLEAARGGGHH!! !” – An attempted furry meets an angry Kemba. Just think of where all the spells in a Kemba deck come from. You want a Loxodon Warhammer, or maybe some Lightning Greaves? Mirrodin. How about a sword of [value] and [winning]. Mirrodin. 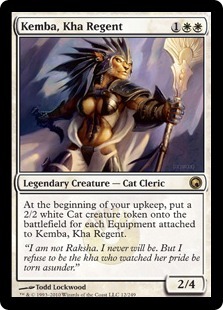 A White Sun’s Zenith to make some back up kitty tokens? Mirrodin. How about and equipment boosting package, like Puresteel Paladin, Steelshaper’s Gift, or maybe Stoneforge Mystic? Mirrodin, Mirrodin, and Mirr… Oh wait, that last one is from Zendikar! Finally we break the monotony! Get the picture? It doesn’t take much tweaking to turn your standard Kemba-Equipment deck into the fable of Kemba, last guardian of a pure Mirrodin, leading the charge against the Phyrexian invaders with a Sword of Fire and Ice in hand and a Glorious Anthem ringing on her lips! Plus, it’s the closest you’ll get in Magic to killing someone with the cast of Thundercats. Now this is a blue deck that even I kind of want to play. I don’t doubt that there was some poor soul who was playing during Lorwyn who was upset that they didn’t print a legendary changeling, never realizing that Wizards had already done it years ago. I was all creature types before it was mainstream. 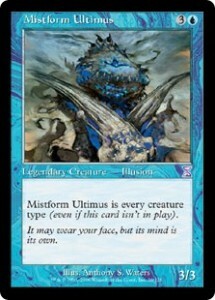 Playing a Mistform Ultimus Voltron-control deck is an awesome way to use every single blue tribal card you have ever heard of, and probably a few that you haven’t. Ever wanted to play Swarmyard in EDH? How about Lord of the Unreal? You can do all this and more when you play this sweet illusion creature as your general, and it’s not a stretch to imagine an awesome story for him. The ultimate thief and trickster, this illusion drifts from plane to plane, leaving suckered marks and confused authorities in his wake. From some, he steals valuable items or magic. Others he tricks (using mundane or supernatural methods) into joining his cause and lending their strength – all to build up his power so that he may one day overcome a foe known only to him. The other beautiful thing about playing him is that you are guaranteed that Wizards will only keep releasing more and more powerful cards that fit perfectly with him. (Does Master of Waves seem really good in this deck, or is it just me?) In fact, I wouldn’t even really need blue staples to play him. I could just… NO! NO! THAT’S A BAD ERIC! A VERY, VERY BAD ERIC! YOU DON’T DO THAT! *cough* Sorry about that. I had kind of a weak moment there, won’t happen again. Let’s move on. There are a lot of super flavourful options for mono black, and most of them are really strong. Like really, really strong. When someone asks if you are a god, you say YES! Half of you now have the Ghostbusters theme stuck in your head. 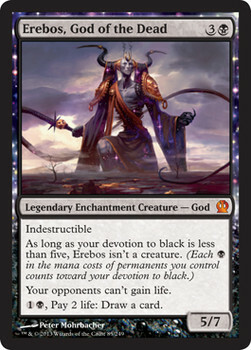 The real beauty of using Erebos, God of the Dead in a Vorthos build is that he is both rich in flavour and totally open to interpretation. Is he raising an army of Reassembling Skeletons and Hell’s Caretakers to finally wage that war on the world of the living of which he’s been deprived for so long? Is he Dismembering those who should have died long ago, and have cheated him until now? While Mistform Ultimus is awesome because he allows you to use cards you never would have before, Erebos is great because you can use almost all the cards you were using already, and they fit him like a glove. Black has so many graveyard and necromantic themed cards, and they could all fit perfectly into an Erebos build without the tiniest problem in theme. Who better to use Damnation as a tool than a god? And as someone who recently tore through a multiplayer EDH tournament with a Purphoros deck, I can tell you that there is just a special tingle you get when you drop Cavern of Souls and name ‘God’ as your creature type. Not to mention the look you can give other players when they say they’re playing reanimator, and you point out that you are playing the freaking GOD OF THE DEAD. Seriously, that should immediately lead to voided bowels just on principle alone. Since this is an opinion based piece on things that are my favourite, I’m going to go ahead and say it: There is no tribe cooler than goblins. There might be stronger tribes, bigger tribes, scarier tribes, or prettier tribes, but there are none that are cooler. Disagree all you want, doesn’t change the fact that I’m right. Cards like Goblin Lackey, Goblin Sharpshooter, Goblin Piledriver and Skirk Fire Marshal don’t just have powerful effects, they have cool effects. Things that you won’t find in any other card. And there are few generals more suited to leading a charge of goblins than Krenko, Mob Boss. He’s grinning because he’s happy. And that should make you scared. And the beautiful thing about Krenko is that you can back him up with tons of non-tribal cards that are absolutely devastating but that still fit the mob justice theme – like, say, Mob Justice? Maybe his mob of goblins is causing some Gratuitous Violence, or maybe they are grabbing some townsfolk to Burn at the Stake. And even if it isn’t strictly tribal, a good ol’ Goblin Bombardment is always welcome. Of all the generals on this list, Krenko is arguably the most powerful and definitely the most explosive. So if you’re looking for a Vorthos-friendly deck that can shorten up some of those longer games and tear through a board of players faster then anyone thought possible, look no further than Krenko. Frigging goblins, man. I love the ugly buggers. I’ll be honest, I am coming way out of left field with this one. I thought about showing some love to elves and using Ezuri, Renegade Leader or talking about how having Thrun, the last Troll going on a rampage because of the genocide of his people was awesome. I settled on Reki because I didn’t think anyone would expect it and because the flavour of a deck full of legends being told by him is just so damn strong. It was very Vorthos of me. Stay a while, and listen. YOU KNOW I WASN”T THE ONLY ONE THINKING IT. Picture an old storyteller on Kamigawa, telling all the youngsters tales of warriors and spirits. Picture him telling not just tales of Kamigawa, but of mysterious and far off lands. Tales of poor lonely Thrun, or the terrifying and colossal Polukranos. Picture him telling Azusa stories about the Kodama of the North Tree or the otherworldly Eldrazi titans. Then picture that one day, interlopers come demanding Reki’s knowledge. And Reki responds by using strange magics to bring his stories to raging life. Green doesn’t historically have the best card draw on the planet (though certainly better than some other colours) and Reki will help you to not run out of gas while stomping your way across all your opponents with giant green legends. The really nice thing is that his ability triggers on cast, so even if your Bow of Nylea gets countered you still get the cantrip effect. And no one will ever see your Reki Deck coming. 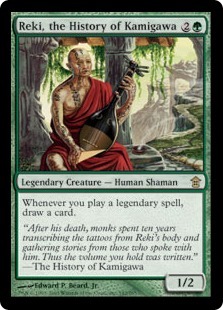 Do I think that Reki is the best mono green option? No. Do I think that the elf tribal deck I initially thought of was stronger? Almost certainly. But Reki is a historian and storyteller, and the idea of him animating and tearing through enemies with literal legends is very, very cool. And every time you get to draw a card because Reki told the story of Multani, Maro Sorcerer I’m sure you will smile at least a little. Like I said, very Vorthos of me. 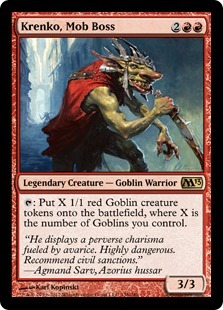 If you want to scream at Eric because goblins aren’t as awesome as he thinks, do so in the comments below. Or feel free to hit him up at EricBonvie@gmail.com or on Twitter @ThatBonvieGuy. And don’t forget to check out Rival’s Duel, his show with Nole Clauson. A new episode is up in just two more days!